HOW IS IT GREAT? Utah spent 52 seasons as a member of the Rocky Mountain Athletic Conference (1910-1937) and the Mountain States Conference (or "Skyline Conference," 1938-61). These conferences received little attention nationally, but once in a while they produced a player that simply could not be ignored. Such stars included Byron "Whizzer" White of Colorado (1936-37); Thurman "Fum" McGraw of Colorado State (1946-49); Eddie "Boom Boom" Talboom of Wyoming (1950); and Ernie Pitts of Denver (1956). But the first, if not the greatest, was Earl "Dutch" Clark of Colorado College. Clark was virtually unstoppable in 1928. In one game against Wyoming, he had runs of 77-, 70- and 55-yards en route to a 374-yard rushing performance that included five touchdowns. He would go on to earn All-American honors - one of the few to come out of the Rockies during that era. Following his collegiate career, he spent seven seasons in the NFL - leading the league in scoring three times, and earning All-Pro honors six times. In 1963, he was inducted into the Pro Football Hall of Fame. Colorado College's 1928 showdown against Utah would be remembered for decades as the greatest game played in Ute Stadium. Coach Ike Armstrong's teams were best known for their offensive prowess (particularly in the passing game). But Utah's gameplan against the undefeated Tigers was to win with defense and field position -- sometimes punting on early downs. Utah's defense keyed in on Clark's passing game and held the Tigers to just four completions on nineteen attempts. But those completions were huge. One was a bomb from midfield that resulted in a touchdown. Clark also caught a 35-yard pass and had two interceptions on defense. With just a minute left in the third quarter, he scored on a 4-yard run and kicked the PAT to put the Tigers up 21-7. And then came the great comeback. Utah finally resorted to its aerial attack, which immediately set up two touchdown drives. The score was tied with five minutes left in the game, but the Tigers were not content with a tie. 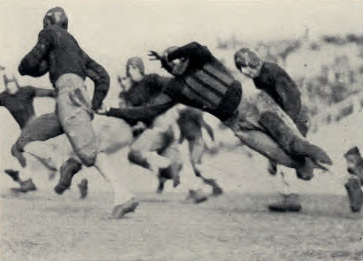 They made an aggressive attempt to win through the air; but a Clark pass was intercepted and returned to the Tiger sixteen-yard line by Ralph Goodwin. Two plays later, Goodwin ran it in for the winning score. Pete Couch sealed it by intercepting Clark's final desperation pass. Dutch Clark spent five seasons with the Detroit Lions and was a member of the 1935 NFL Championship team. That team also prominently featured two former Utah greats: Jack Johnson and All-American Frank Christensen. A public stadium in Pueblo, Colorado, was named in honor of Dutch Clark. He is immortalized by a statue at the entrance (pictured). Game recap from the Ogden Standard-Examiner. A TIGER "groar" rolled out into the new University of Utah stadium long before the whistle blow on Saturday. It was sounded by a small crew of Bengal hopefuls and even then it had an ominous message. To the Redskins of Utah it served to say what has always been said of Colorado College teams -- that the Tigers have the Indian sign on the men of Utah. For three quarters the message was borne out. But in the final period the Redskins triumphed in the most spectacular and plucky comeback in the history of Utah football. The Crimson cloud o'er shadowed the field at the finish but for three quarters all good Utah cohorts shivered in the blasts that swept the east bench, with that sinking feeling that another great Tiger team had laid a jinx on the Utes path to victory. But Utah won 27 to 21. The Tigers left the field at the half a winning team. Earl Clark, the "Flying Dutchman," floated a pass to "Inky" Ingraham on the Utah 35-yard line and there was no opposition in sight as Ingraham raced over the Utah goal line for a touchdown. Another pass play as the first quarter ended, placed the oval on Utah's 20-yard line and then Clark slipped around right end for a touchdown and it looked like a riot for the Bengals. The loyal supporters of the Crimson pleaded for their valiant Braves to fight! fight! fight! And how those Redskins did respond. Led by the indomitable Jimmy Hodgson, who skirted the end, slipped through tackle and vaulted over center for yards and yards, the Utes jammed through to Colorado's 35-yard line. Then Ralph Goodwin tore off a 25-yard gain on an off-tackle thrust and the ball was on the Tigers' 10-yard line. Hodgson carried it five yards and Pomeroy one, then the dependable Pete Couch bucked it over. Utah fight had placed her back in a ball game which was evidently lost, hopelessly. The Bengals got a nice break in the third quarter to chill the Crimson's hopes once more. There was a jam-up on signals and a pass from the Utah center went haywire. Hayden, an alert C.C. guard, recovered deep in Utah territory. Once more the "Flying Dutchman" squirmed around end and the big scoreboard read: Colorado College, 21; Utah, 7. But Utah fights! How she does fight! Resorting to the Tigers' own game, the aerial attack, Goodwin shot a 30-yard pass to Watkins, fast-stepping end and then Hodgson squirmed through for two successive eight-yard gains to place the ball on the C.C. two-yard line. Hodgson called Couch through center and the big blonde halfback added seven more points as he confidently plunged over the line and place-kicked for the extra point. Score, Colorado college 21; Utah 14. Even then victory seemed yet a great way off. The aerial game was the Crimson's only hope and how she did play it. 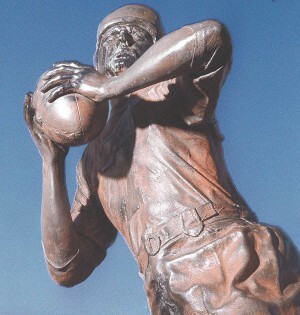 Three minutes after the final quarter began, Goodwin again rifled a herculean heave to Cecil, towering wingman and before the Tigers knew what had happened, the Utah end had the ball and was racing for a touchdown. Clark finally downed Cecil on the eight-yard line and the Utes' thirsty for victory opened up their wonderful scoring punch. Hodgson again took the ball three yards on a cut-back play and then slipped through tackle for two more. Again he called upon Couch who vaulted over the C.C. line for a tieing touchdown as big Pete was once more accurate on his placement trying for the extra point. Fight had brought Utah at least a tie. Ten thousand fans went into a furore of [??]. The Tigers were dazed. Their confident air was lacking. They began throwing passes with hopeless abandon. The mighty Clark spotted Beery, his star end, and directed a spinning shot which headed true for his man. But just as Beery attempted to catch the oval, the ever aloof Goodwin sneaked the ball from his grasp and raced down the field for a touchdown -- the winning score, with only two minutes left to play. Couch missed the kick for extra point but nobody cared. Utah was already "in" with the ball game and it was because Utah fights! It was a clash of giants -- this Utah vs. Colorado College game. Two mighty teams each with the tremendous scoring punch battled for the supremacy of Rocky Mountain Conference. The hopes of the Centennial state were on Coach Bill Van de Graaff and that marvelous eleven-man machine which he has spent two weary years to develop to the acme of perfection for this great moment. It must have been a great disappointment to the Tigers' splendid coach and his [brave captain Roy] Vandenberg broke down and cried when Goodwin intercepted Clark's pass and raced over the line for that winning touchdown. It was a heavy [hearted lot of] Colorado [athletes that] boarded a train eastward-bound Saturday night. The Tigers had Utah's plays well in mind due to the very skillful scouting of Alvin Twitchell, former Utah athlete, now assistant coach at Colorado college. This knowledge of the Crimson's plays was especially evident in the first quarter during which the Tigers nipped every Utah thrust before it could get started. After that the Utes shifted their plays into reverse and made better headway. The Twitchell-coached C.C. line held up surprisingly well under the battering it received from the heavier Utah forwards. Beery and Osborne are two of the best ends the conference ever produced. Jonas at center for Utah played-down his opponent after a terrific battle as this Weaver boy is a tough man, especially on the offensive. Capt. Carmen played great football as did the two Utah guards, Dean Olson and Wes Anderson. In the final period Anderson sustained a badly wrenched neck and was taken to a hospital where rest and quiet were prescribed. It is unlikely that he will be able to play next Saturday against Creighton. In the last three weeks Colorado has pitted its three best football teams against the fighting Utes and three times the youthful Redskins have battled their way to victory. Colorado Aggies, 1927 champions, were the first to fall, in a game which provided a tip-off on what might be expected from Ike Armstrong's Sophomore aggregation. Next came Colorado "U", a well-trained veteran aggregation which fell before the powerful Armstrong system, 25 to 6. Colorado college, last hope of the Centennial state for a championship, has now passed from the picture. This is indeed another Utah year!